Danielle is an essential oil educator who is passionate about helping others to improve their health and wellbeing, by teaching them how to live a natural, non-toxic lifestyle with dōTERRA. Essential oils are aromatic compounds extracted and distilled from the leaves, flowers, stems, seeds, roots, and bark of plants and trees from all over the world. For a plant, essential oils provide immunity, protection from predators, and promote healthy reproduction and repair. Similarly, essential oils can provide the same support to the human body! Busting stale patterns, reconnecting to authentic selves, rebalancing health and happiness: all in a day’s work for Reiki Master and Intuitive Healer, Jordana. Jordana loves seeing people bring the glow back to their life through the power of reiki. A mediation teacher and certified yoga instructor, Jordana is a world traveler who's studied and taught throughout Australia, Asia and Central America. She’s also known to love every dog ever. Daniel is a certified Kali-Ki and Usui Reiki Master and Intuitive Healer practicing in San Francisco. Working with you and your guides, he specializes in identifying energetic blocks which can lead to anxiety, emotional distress and physical discomfort. A firm believer that “the body is the last to know,” Daniel works systematically with your energetic centers while taking instruction from Spirit as to which areas are in need of attention. The result is not only a greater immediate sense of lightness and relaxation, but often specific takeaways and clarity on issues that can be carried into day to day life. Daniel takes great joy in supporting others as they learn to give themselves permission to heal at every level. He considers it an honor/duty to serve both Spirit and his clients in whatever capacity he might. Now Chase the Sun is a curated collection of ethically sourced, beautiful jewelry and accessories made by low income artisans, refugees, small business owners and entrepreneurs all over the world. We design and source fairly from inception to completion - people, animal and earth-friendly products that bring sustainable revenue to the artisans. Each bead and stitch is put together with love and care by hand – no factories, mass-production or environmental waste. The company was founded by Koshi Samarasinghe, who spent many years managing key customer relationships for tech companies in the Bay Area. In August this year, she followed her dreams and founded a small business that works to create economic opportunity for craftspeople in need of income - Now Chase the Sun. No animal products (Except in the Doggy Couture Collection). Love, acceptance and respect are a key part of what we do. Give back: We donate a % of profits each month and keep our prices affordable, because it shouldn't cost the earth to make ethical purchases. We are based in San Francisco, and our goal is to serve our community by uncovering new ways to support the artisans and artists - both here and overseas - who keep our communities beautiful and diverse. Ariel is an experienced nutrition & wellness coach with a passion for helping growth-oriented women and men optimize their health and wellness potential through exercise, nutrition, and personal and professional development. As founder and CEO of her own holistic wellness coaching company called Fueled by Four, she works one-on-one with clients and facilitates corporate wellness programs on a wide variety of topics including movement and proper body mechanics; strength and cardiovascular training; mobility and flexibility; eating for fat loss, mass gain, and general health; time restricted eating and intermittent fasting; circadian rhythms; sleep quality; mindfulness and meditation; inter and intrapersonal relationships; and reducing environmental exposure to toxins. Ariel is very excited to be offering mini nutrition coaching sessions at the Holistic Health Saloon! She is available to help answer any nutrition or fitness-related questions, to explore together what a typical day of eating looks like for you and where there may be areas of opportunity, and to provide otherwise coaching based on your health and wellness goals. Ariel earned her degree in Psychology from UC Santa Barbara. She is a National Strength and Conditioning Association Certified Personal Trainer and a former Tier 3+ Personal Trainer at Equinox. She is also a Certified Nutrition Coach through Precision Nutrition. Medicine comes in so many different forms. Words, sound, touch, plants--all these can offer you strength and support as you grow and heal. Licensed as an acupuncturist and herbalist, Courtney also uses her powerful intuition to assess every patient's current needs. All of her formal sessions include detailed pulse diagnosis, acupuncture, and bodywork, as well as recommendations for herbs and supplements to support your process. This work is particularly appropriate for physical pain, emotional pain, spiritual crisis, and stress management. Dominique (she/her) is a Bay Area native that is deeply passionate about sharing liberating expression to diverse communities. Her work experience is an eclectic mix of nonprofit management, workshop facilitation and teaching mindful movement throughout the SF Bay Area and abroad. With an academic background in psychology, she believes that providing trauma-informed tools for emotional and mental healing are critical for decolonizing wellness. She is interested in the intersections of healing, justice, and liberation especially for BIPOC [black, indigenous, people of color] and folks that identify as LGBTQI+. Along with sharing mindfulness practices, she works as a Peer Advocate supporting LGBTQ survivors at a SF Based non-profit organization called Community United Against Violence (CUAV). This workshop will provide a space to release physical, mental and emotional tension. Since we are feeling the heavy impacts of suffering in our world we will approach these healing practices as a way to cultivate gentleness with ourselves. We will explore restorative poses and meditation to soothe the nervous system and encourage deep relaxation. Come in comfortable clothing. Open to all levels and bodies. Anni is excited to offer crystal body balancing--a blend of intuitive counseling, crystal healing and energy balancing--at the Saloon! Anni is a certified hypnotherapist and body balancing practitioner, with additional training in biodynamic craniosacral therapy. She blends these modalities to address blockages in the physical body and beyond. Anthony Compagnone and Renee Blodgett are the twin souls behind Blue Soul Earth, which is dedicated to elevating global consciousness and awakening through channeling, events, content and healing in order to awaken and ignite your Soul’s Purpose. Blending their skills and passions together, they lead workshops, Blue Soul Circles, and channel wisdom, messages, clearing and healing to those on their life journey. While Anthony is in trance, Renee will translate and ground the sacred space as you connect to spiritual light beings, such as Ascended Masters, Spirit Guides, Angels, Kwan Yin & Christ Consciousness, Goddesses, Priestesses and Galactic Beings. Sometimes healing on particular chakra points or other areas of blockage may occur. We help to let past traumas go through past life “insights”, energy clearing, healing and messages from the “Other Side.” There is no religious dogma in our work and we embrace all walks of lives and belief systems. Over time, we have learned that we are all connected as Universal Consciousness and that the strongest thing in the Universe is divine love, which runs through all of our Soul Streams – from this place, we can heal ourselves, each other and the planet. We are also both certified in Reiki and passionate about helping others let go of fear and step into their divine purpose and path. You can find out more about our work at www.bluesoulearth.com and on social media (Instagram, Twitter & FB) @bluesoulearth. Join us for a fun and engaging workshop where you will reconnect with your true essence and gain clarity on all that your soul is wanting to manifest through you at this time! In this workshop, Christina will share insights in how to master your own energy by moving beyond the five senses and tuning into the world of subtle frequencies and vibration. Christina will also lead us through a powerful activation process where you will uncover and release the blocks holding you back from living the life you desire. Through this live, guided journey, you will access a clear and direct connection with your own higher self to receive downloads about your own soul’s true essence, power, and purpose for this lifetime. This is an opportunity to experience a powerful process that Christina uses with her one-on-one clients to rapidly release the biggest blocks that are preventing them from accessing the natural state of abundance, flow, and creativity in their lives. As we increase in frequency and develop more of our spiritual gifts, we are being called to step up our energy awareness, or suffer bigger consequences. This workshop will be an activation and energetic healing experience, so if you can, please come hydrated and bring your journal. Christina is an empath, intuitive healer, and manifestation guide. Her greatest joy is uplifting and inspiring others to access their highest joy and greatest potential in this life. As a healer, she guides her clients through transformational sessions, quickly releasing deeply held blocks, limiting beliefs, and negative energies so they easily realign with their natural state of joy, creativity, and abundance. As a manifestation guide, she teaches her clients to access the realm of subtle energies so they can step back into the flow of magic, joy, and synchronicity in their lives. Christina also leads sacred ceremonies and private rituals to reconnect with our hearts, opening the portal to the divine to activate deep healing on an individual and collective level. Having an extensive background in both science and spirituality, she has learned to access guidance from the higher dimensions while being grounded in the methods of scientific inquiry to bring her clients greater ease, clarity, and joy as they navigate their own ascension process. Are you carrying emotional baggage and old traumas that are holding you back from creating the life you desire? Most people unknowingly go about their day feeling anxious, insecure, unmotivated, filled with self-doubt and unworthiness, chronic pain, depression, and the list goes on. What we don’t realize that most of us carry around invisible energies in our fields from negative emotions we experienced in our past. These trapped emotions keep us in lower vibratory states and cause us to attract more of the same negative experiences, keeping us in the same patterns of doubt, fear, and self-sabotage throughout our lives. Join Christina Cunnison, for a 20 minute private session to clear your energy of the trapped emotions that are clouding your natural state of joy, enthusiasm, and inspiration. Come ready to focus on any current struggle ranging from relationship issues, finances, career, physical health, or personal challenges. Christina will tune into your subconscious and will clear energies from negative past experiences so you walk away feeling lighter, more clear, and uplifted. Moon + Leaf combines the power of CBD and herbalism to create organic products that alleviate period pain and support your glorious body. We created these products for you, sister, to create a ritual of self-love during that miraculous thing your body does each month–have a period. Let go of stress + resistance and get back in the zone in your biz and life. Let go of the past and tap into your vision. Attract more abundance, love and good into your life. Release what is not working and move in the direction of your dreams. We will spend the afternoon tapping away blocks to new beginnings, setting intentions and visualizing. This will be a powerful way to get focused, release blocks and tap in to magic in your biz and life. Kate Winch is a transformational speaker, Tapping Practitioner and loves helping people get unstuck and move towards their dreams. As a Certified Life Coach and founder of Surrendered Healing, Adelina specializes in supporting women of color, LGBTQ identified persons and other people from underrepresented communities stop living a life on auto-pilot and instead tap into their higher selves to create richer and more fulfilling lives! When she was 5 years old, Adelina learned about her familial indigenous gift of intuition and has since continued to hone in on her intuitive gifts through guidance from her ancestors and Higher Power. Through their support, she was guided to study under some of the greatest teachers of intuition and now has a 4-step system for precise and purposeful manifestation to support people past their limiting beliefs and fears into a life that they love! Adelina has a Masters Degree in Social Work and has had the honor of serving organizations, families and individuals for the past 14 years. She has been a keynote speaker for UC Berkeley, a featured guest for Winning With Other Women, interviewed by the podcast Never Give up Hope, a consultant with Alternatives in Action, shared a stage with Mary Morrissey and so much more! As a sought-after life coach, professional speaker, and healer Adelina offers inspiring workshops to sold-out audiences around the country as well as transformational in-depth coaching programs that help clients achieve new heights of success, meaning, and spiritual aliveness. Jak’s approach to healing comes from a deep understanding of the Tao, the interplay of energy that connects all things. Meditations and Chi Kung practices have instilled an awareness in him that he brings to Chi Nei Tsang sessions. An ancient technique combining Chi and Touch, Chi Nei Tsang is focused and directed to the abdomen. Energy and awareness, combined with Jak’s gentle listening touch, provide an opportunity for the release of tensions. Emotional charges reside within the abdomen. Revealing the existence of these charges increases the conscious-subconscious connection. During treatments a healing environment is created so that these charges can be observed, acknowledged, and released. Balancing the digestive system has profound effects on the entire being. Physical and mental wellness, as well as emotional and spiritual awareness are enhanced through Chi Nei Tsang. Jak Noble is a Global Body (Level III) Certified Practitioner of Taoist Healing Energetics (Chi Nei Tsang Institute). His practice is located in Berkeley CA. Learn more about Jak's work here! Peace and love. 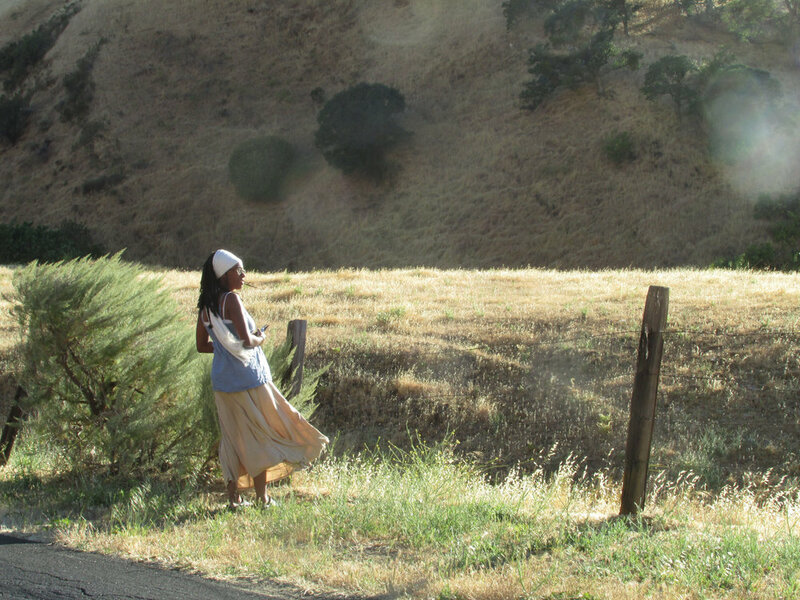 My name is Aminah Moon, and I am the hands and heart behind Mama Goddess Herbals. I am a folk herbalist, a nature bruja, and a magic medicine woman all via my bloodline and my ancestors. I do this work because they did and they appointed me with the task in these modern times. I am very passionate about this path that chose me. I offer herbal medicines for physical and spiritual healing because healing is holistic and we must combine healing of the body with healing of the spirit. That being said, I also offer copper and gemstone healing tools and adornments to further facilitate in spiritual healing a protection. I look forward to sharing my heART with you all. Kim is a Reiki Master and Intuitive Counselor in SanFrancisco. She has been immersed in the world ofhealing for over 25 years. Working with both humansand animals, she supports others to have a morepeaceful, joyful, and balanced life with less emotionaland physical pain. Kim received her first and second Reiki certifications in2012 and became a Reiki Master in 2017. She workswith clients in person at her home office in the InnerRichmond as well as through distance Reiki, a powerfulmethod performed energetically on clients from anydistance. She is passionate about sharing Reiki’s miraculouseffects. Drawing from her extensive healingbackground, intuition, and heart centered awareness,Kim loves helping others understand, break through,and heal from whatever is holding them back fromultimate happiness, love, and fulfillment. Emily Leahy, founder of Return to Sacred, is a certified healer, teacher, Kabbalist, ritual master apprentice and guide in the Modern Mystery School. She specializes in supporting passionate hustlers who crave to ditch burnout and claim their worth to make a lasting difference in the world. Using grounding techniques and tools, she teaches how to create balance, master boundaries, and develop a stronger capacity to face life’s challenges. Emily believes in individual empowerment for collective impact through the application of these ancient tools. Edward has over twenty-five years of experience with open-hearted meditation and martial arts. In 1995 he started practicing Aikido, a martial art based on unconditional love. In 2005 he began studying Sheng Zhen, a practice of movement and meditation to open the heart. He loves to teach Aikido and Sheng Zhen classes to both adults and children. His coaching practice, Open Hearted Coaching, applies the science of unconditional love to help clients combine meditation with an open heart to lead a happier life. He currently offers programs for executives, couples, professional athletes, and people looking for better sleep. Sign up for a session to learn a few movements or a short form from the practice of Sheng Zhen. Cultivate qi together with love to open your heart, purify your body, and connect to the entire universe! Come experience the power an open heart has on our health and healing! In the practice of Sheng Zhen we learn to embody unconditional love through movement and meditation. The moving forms help to relax the body and cultivate Qi, and the stillness allows one to quiet the mind and return to our original purity. In this workshop we will practice two forms from Sheng Zhen that gather Qi together with Unconditional Love for a healthier body, a happier heart, and an awakened soul! These movements are accessible to people of all ages and physical ability. Dalina In and Elaine Guillon are the founders and practitioners of Eternal-Therapy. A place for alternative therapy and spiritual development. E-T is a place where people can expand their minds and make the connection between mind-body-spirit using hypnotherapy, sound healing and Reiki. Jaya Moksha creates radiant jewelry, scarves, malas, and other treasures that are inspired by spiritual symbolism and designed to adorn you with meaning. You can check out some of her beautiful earrings, necklaces, rings, nose jewelry, scarves and more at etsy.com/shop/JayaMoksha and she'll have a lot of special items at the Holistic Health Saloon for holiday gift giving that aren't available online! I am Megan Bovis and a practitioner of Biofield Tuning, ThetaHealing®, flower essences as well as various types of hands-on energy work. I was first drawn to working with subtle energy in 2001 through experiencing the deep nurturing power of Reiki. That same year, I had a profound shift through the power of sound that propelled me on a journey that continues today. I love working and connecting with others through my hands, sound and presence. Through these modalities, I hope to help you find physical and emotional resiliency and the capacity to affect positive change in your life. Sessions are held both in-person in San Francisco and at a distance.